That was the Armsman’s Tavern arena, right? The Ardashir arena can give you a very nice epic 2HB weapon, lvl 55 required. If I remember right there are also some nice weapons that can drop during the level 60 destiny quest, and you can often find those fairly cheap on the Trader. There are also a solodungeon in Gateway to khitai called The forgotten city that drops nice rings and necklace for your class. Combat rating, hit rating and crit. The best thing here is that the instance scales with your level so every time you go there between level 40-80 you will have a chance of getting an upgrade. There also the breach in gateway which gives you a nice cloak at the end. Works the same way as forgotten city with item scale. Keep in mind that these are soloinstances and that they are quite harder than leveling. 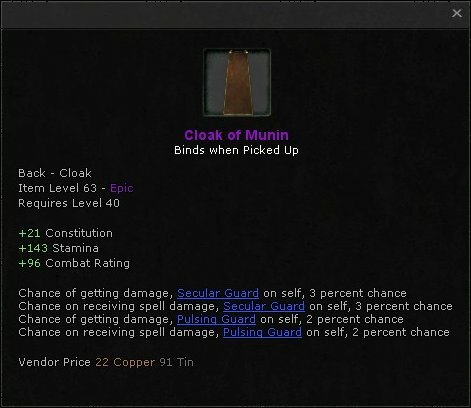 In Ymir Pass you also get a group quest, to be done in AoK, that gives an epic lvl 63 cloak: Cloak of Munin.